Laurie Swim is inspired by her Nova Scotian surroundings and has spent decades interpreting them through the medium of quilting. 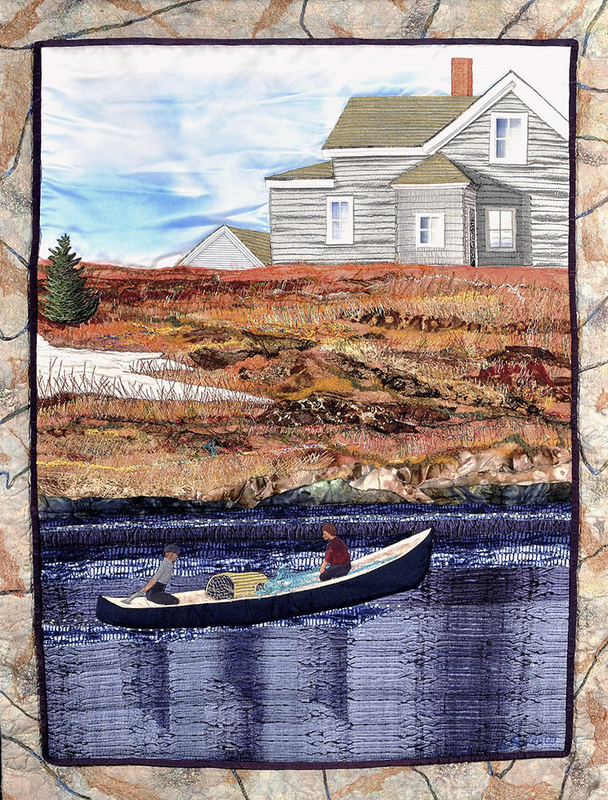 This is certainly evident in Swim’s Make-and-Break, a Nova Scotian fishing scene that captures history, landscape, and architecture in an intricately quilted image that is strikingly pictorial yet dedicated to an exploration of fibre. Laurie Swim is recognized as one of Canada’s leading textile artists. She received her BFA from the Nova Scotia College of Art and Design in 1971, and undertook an apprenticeship with the Danish designers and weavers Lisbeth Have and Annette Juel in Copenhagen, Denmark from 1974 to 1975. Following her apprenticeship she has sustained her art practice through commissions, sales, and exhibitions of her intricate quilted wall works. She is the recipient of the Portia White Prize (2013), the Dorothy McMurdie Award (2013 Canadian Quilters Association), and the Established Artist Recognition Award from the Nova Scotia Designer Craft Council (2009). As well, Swim is recognized as the author of several key books on contemporary quilting, The Joy of Quilting (1984), Quilting (1991), and Rags to Riches: The Quilt as Art (2007). The Nova Scotia Spotlight series highlights recent acquisitions to the Art Gallery of Nova Scotia’s Permanent Collection by artists contributing to the province’s cultural heritage. With support from Michelin North America (Canada) Inc. and the Donald R. Sobey Family Foundation in Memory of Robert W. M. Manuge.